This PDF 1.5 document has been generated by / doPDF Ver 8.7 Build 943, and has been sent on pdf-archive.com on 11/12/2016 at 12:04, from IP address 105.112.x.x. The current document download page has been viewed 159 times. Ph. 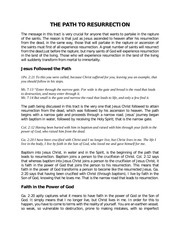 3:11 and so, somehow, to attain to the resurrection from the dead. on to take hold of that for whichChrist Jesus took hold of me. Jesus. The starting point of power is knowledge. seed, which a man took and planted in his field. 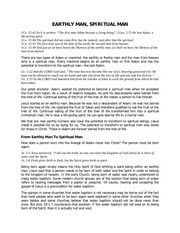 understanding of the first man, Adam. Ro. 5:14 says that Adam was a pattern of Jesus. lodge in those branches. A woman (Eve) brought sin or evil spirit into the human race. remains only a single seed. But if it dies, it produces many seeds. Jn. 15:1 “I am the true vine, and my Father is the gardener. will bear much fruit; apart from me you cando nothing. In the fullness of time, God planted a new human seed on the earth; a grain of wheat. new human seed to be fruitful and multiply spiritually. nostrils the breath of life, and the man became a living being. of the knowledge of good and evil. Mt. 4:1 Then Jesus was led by the Spirit into the desert to be tempted by the devil. River Jordan, God birthed a spirit being in him and then moved him into the desert. Mt. 4:11 Then the devil left him, and angels came and attended him. spread through the whole countryside. mightily towards the likeness of God. He began to do great things. Ph. 2:11 and every tongue confess that Jesus Christ is Lord, to the glory of God the Father. spiritual body. It is mortal being swallowed up by immortality. must be fed with spiritual food and spiritual drink. 1Co. 10:2 They were all baptised into Moses in the cloud and in the sea. accompanied them, and that rock was Christ. us, on whom the fulfilment of the ages has come. spiritual drink. We should feed on spiritual food and spiritual drink every day. the work of God to the full; God raised him to the highest possible spiritual level. his sufferings, becoming like him in his death. world has been crucified to me, and I to the world. carrying of the cross and by dying to the world. the Father is not in him. boasting of what he has and does — comes not from the Father but from the world. how well you could grow in the Spirit. to destruction, and many enter through it. Mt. 7:14 But small is the gate and narrow the road that leads to life, and only a few find it. Mt. 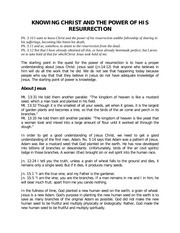 13:45 “Again, the kingdom of heaven is like a merchant looking for fine pearls. This file has been shared by a user of PDF Archive. Document ID: 00520670.